The Little Yellow Basket | NJNA is Blogging! Monday and Tuesday were spent in a wonderful class with Margaret Kinsey. She is a very flexible teacher who gives lots of attention to each student. It was a smaller class (12) that Dee and I took together..
Monday was spent building the basket and Tuesday we began on the bling. The memory wire flower (there will be two) and the flower on the left side will be filled with purple chipped beads. There also will be lots of beads with spangles. I wanted to wait to add beads when all stitching is finished so nothing catches. 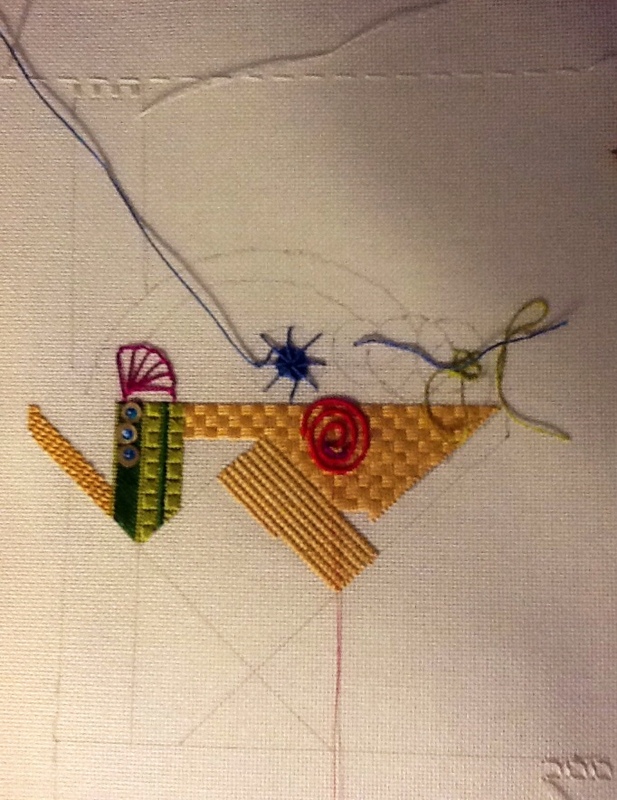 We started the background which is a combination of pulled work and darning stitches. Today is a cruise on the Chicage river to get a different perspective on Chicago architecture.